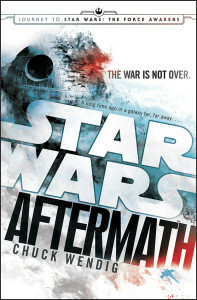 Getting a little excited for the upcoming Star Wars film, I was glad to see that Aftermath was available at the library. I was eager to get caught up with events leading up to the new movie. The book was well written, but didn’t really touch on any of the big players in the Star Wars universe. I guess this should have been expected, but still I was hoping to read more about some of the big names. Granted Wedge Antilles was always been a favorite of mine, even his story was all that large in the book. I really thought he was going to have a bigger role when I first started reading. Oh well. Overall, it was interesting to get an idea of the state of affairs immediately after the Return of the Jedi. Looking forward to the movie in a few weeks.